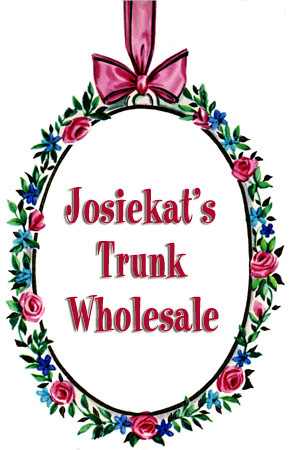 Josiekat's Trunk is available for wholesale ordering. Please read through the following information to answer questions regarding terms and conditions. Josiekat's Trunk apparel and accessories have a wide appeal for both the online and brick and mortar boutique industry. We are a small company that provides direct customer service and individualized attention. Our items are all customized at the point of order placement. We strive to provide unique clothing that exceeds quality and design standards. Simply Bows, our most popular line is available for wholesale ordering for your boutique. We have also included select sets from our Vintage Tees Collection, baby items, leggings and diaper covers in our wholesale availability. If you are interested in these lines, please email us for more information and our wholesale order form. Other items such as full outfits and twirl dresses are not available for wholesale at this time. We hand-make everything that leaves our studio and cannot wholesale the entire line we offer. Our wholesale division will contact you regarding available fabrics and specifics. Please contact us via the email link at the top of this page regarding your initial wholesale order. We require a resellers tax ID number and a storefront. Net 30 accounts are available with references. Your storefront should be an actual retail establishment. The turnaround on in-season apparel orders varies depending on demand. Typically, you can estimate a 4 to 6 week turnaround. Once we have verified your information, you will receive our wholesale terms and prices. This will include our minimum order prices and terms of sale. If you have any special requests, please ask. We will provide you with the best service and prices available. We will offer drop-ship accounts on a limited basis.